In 2017, European equity markets showed a positive trend (STOXX Europe 600 index +7.7%), linked to the Eurozone’s economic recovery despite the high level of political instability. This instability led to volatility in price lists during the year, linked to some factors including the elections in France, which required two rounds before seeing the affirmation of the pro-European candidate, and in England, where no party successfully obtained an absolute majority of seats. A further element of instability derives from the negotiations between London and Brussels to establish the strategies on trade agreements that will have to regulate relations between the EU and the United Kingdom after Brexit. 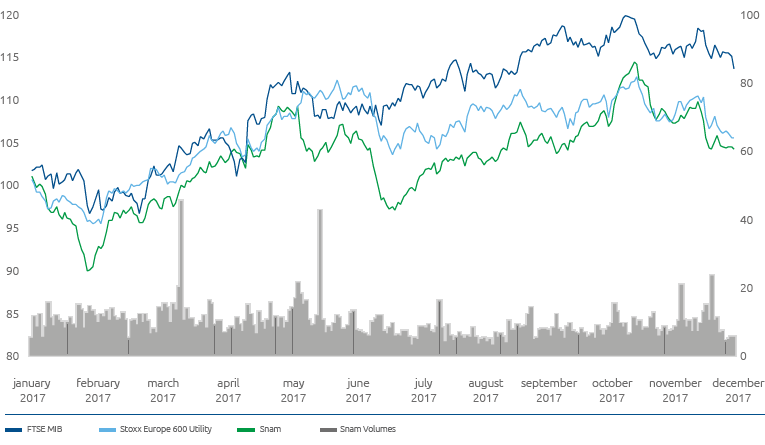 The utilities sector closed 2017 with +5.5% (Stoxx Europe 600 Utilities), negatively impacted by the prospects for an increase in interest rates. In Italy, the FTSE Mib index was +13.6%, driven by good results in the industrial sector, led by the manufacturing and mechanical sectors (the main supplier of goods needed for the 4.0-based renewal), and by the expansionary policies of the ECB from which the banking sector has particularly benefited. The Snam share price ended 2017 at an official price of € 4.086, up 4.2% from the € 3.923 recorded at the end of the previous year. The stock showed an upward trend in the first few months of the year, with a slight decline at the end of the first half. The uncertainty linked to both the Italian political situation and to the UK elections, with the start of Brexit negotiations, weighed heavily. In the second half of the year there was a reversal of the trend and the stock reached its maximum on 7 November (€ 4.486 per share). Both the results of the first six months of the year and a clear regulatory framework with medium to long-term visibility supported the positive performance. In line with the strategic plan, the company has continued its investment activity in Italy with the aim of improving the competitiveness and security of gas supplies, which is central to the energy transition to a low-emissions economy, and the country’s commitment to guaranteeing profitable growth to shareholders. CDP S.p.A. owns 59.10% of CDP Reti S.p.A.
On 19 May 2017, CDP S.p.A. sold CDP Reti SpA the entire investment held in Snam S.p.A. represented by 39,200,638 shares, equal to 1.12% of the share capital. At 31 December 2017, CDP Reti S.p.A. holds a stake in Snam S.p.A. represented by a total of 1,053,692,127 shares, equal to 30.10% of the share capital. Cassa Depositi e Prestiti (CDP), a financial institution controlled by the Ministry of Economy and Finance, whose mission is to promote the growth and development of the Italian economic and industrial system, is a major shareholder in Snam S.p.A.
At year end, based on entries in the Shareholders’ Register and other information gathered, CDP Reti S.p.A. held 30.10% of share capital, Snam S.p.A. held 2.45% in the form of treasury shares, and the remaining 67.45% was in the hands of other shareholders. The share capital as at 31 December 2017 consisted of 3,500,638,294 shares with no indication of nominal value (unchanged from 31 December 2016), with a total value of € 2,735,670,475.56 (equal at 31 December 2016). As at 31 December 2017, Snam held 85,915,616 treasury shares (29,905,180 as at 31 December 2016), equal to 2.45% of its share capital, with a book value of about € 318 million (0.85% for a book value equal to € 108 million as at 31 December 2016). The purchase, in the 2017 financial year, of 56,010,436 Snam shares (representing 1.6% of the share capital) at a total cost of € 210 million, was carried out pursuant to the share buyback programme deliberated by the Shareholders’ Meeting of 11 April 201713. 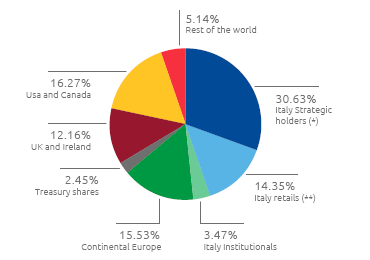 (*) Italian Strategic Investors include Bank of Italy and CDP Reti. 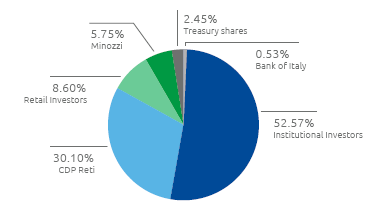 (**) Italian Retail Investors include the shares held by Romano Minozzi (5.75%). Snam’s communications policy has always focused on an ongoing dialogue with the entire financial community. The Company’s goal is to establish a relationship of trust with shareholders, investors, analysts and all financial market operators, and to provide them with regular, complete and prompt information to ensure an excellent understanding of the Group’s performance and strategy. 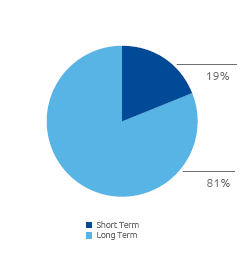 An active policy of engaging investors, supported by clear and transparent communications, contributes to the enhancement of the Company’s reputation, and Snam considers this a strategic factor in creating value in terms of shareholder satisfaction, understanding their expectations concerning Corporate Governance and enhancing the knowledge of all stakeholders who are called upon to make decisions that impact the Company. In 2017, for the ninth consecutive year, Snam stock was again included by RobecoSAM in the Dow Jones Sustainability World Index, the main international equity index formed on the basis of the performance of companies in the area of economic, social and environmental sustainability. 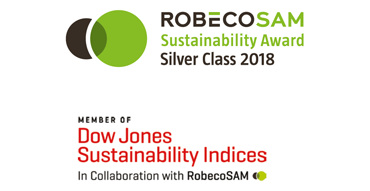 In January 2018, for the fourth consecutive year, RobecoSAM placed Snam in the Silver Class of the Sustainability Yearbook 2018, a distinguished group of companies, which in the industrial sector concerned includes companies with a high score in terms of sustainability. 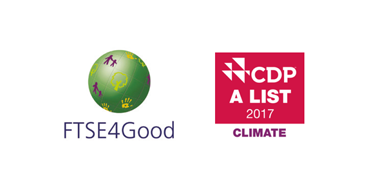 Reconfirmation also took the form of inclusion in the prestigious FTSE4Good index, which the Company has been in since 2002.Snam was also included for the fifth consecutive year among the highest scorers of CDP. The Company was also included in the A List, the highest score of the CDP evaluation model, which in 2017 was only awarded to 112 companies globally. At 31 December 2017, the Group’s net financial position was € 11,550 million, resulting from a financial debt of € 12,619 million and liquid assets of € 1,069 million (including short-term financial receivables). Snam’s goal is to achieve a debt structure consistent with business requirements in terms of loan term and interest rate exposure. In October 2017, Snam successfully completed a buyback on the market of bonds with a total nominal value of € 607 million, with an average coupon of approximately 2.5% and a remaining maturity of approximately 4.4 years. The repurchase price totaling € 656 million was largely financed through a new fixed rate bond issue, expiring on 25 October 2027, for a total amount of € 650 million, with a coupon equal to 1.375% and a duration of ten years. 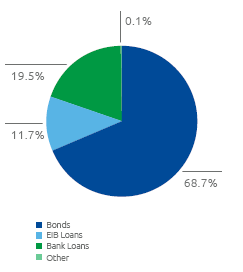 In addition, Snam has also signed a contract with the EIB for the financing of projects promoted by Snam Rete Gas, for € 310 million, with a fixed rate of about 1.5% and maturing in 2037.Loans with the EIB fall under the Group’s policy to optimise its financial structure since they complement bonds and bank loans and have longer terms (up to 20 years) and competitive costs. 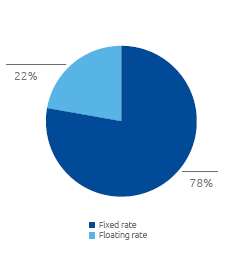 These transactions on both the banking and bond market made it possible to optimise medium- and long-term debt maturities by extending their average term and creating conditions for a reduction in average borrowing costs in 2018. At 31 December 2017, Snam has unused committed long-term credit facilities for an amount of approximately € 3.2 billion. During the year, as part of the process to optimise the financial structure of Group, their duration was extended with a simultaneous reduction in margins. Following the renegotiation, the two syndicated lines, amounting to € 2.0 billion and € 1.2 billion, will expire in 2021 and 2022, with an extension of two years and one and a half years respectively with respect to the previous duration. In addition, on the same date, Snam has a € Medium Term Notes (EMTN) programme for a total maximum nominal value of € 10 billion , of which around € 8.2 billion14 are being used15. At the same time, the communication activity continued with the rating agencies Moody’s, Fitch and Standard & Poor’s, with the maintenance of the creditworthiness rating at the solid investment grade level by Moody’s (Baa1 with negative outlook), Fitch (BBB + with stable outlook), and Standard & Poor’s (BBB + with stable outlook) following the upgrade of a notch on 30th October. The upgrade is the result of a similar improvement by a notch of the Italian Republic’s rating. Snam’s long-term rating by Moody’s, Fitch and Standard & Poor’s is a notch higher than that of Italian sovereign debt. 13 For more information on the characteristics of the programme, please refer to the “Main events” section of this Report. 14 On 6 October 2017, the Board of Directors of Snam resolved to renew the EMTN programme for a maximum value of € 10 billion. The renewal of the programme allows for the issue, by 6 October 2018, of bonds worth up to € 1.8 billion, to be placed with institutional investors. 15 It should be noted that the convertible bond issued in March 2017, for a value of € 400 million, is not part of the EMTN programme.